This is an Inside Science story. Since ancient times, people gazing up at the night sky have seen animals, gods and goddesses, and other entities in the patterns of stars. Now scientists, using modern technology to peer heavenward, have spotted a new celestial object: a somewhat pudgy dragon lurking in the clouds of the Orion Nebula. The dragon's fat shape holds clues about how stars form -- and how the process stops. Orion's Nebula is an enormous cloud of gas and dust about 1,300 light-years from Earth. It's the closest so-called stellar nursery to Earth -- its fuzzy light is even visible to the unaided eye as one of the points marking the hunter's sword in the constellation of Orion. Scientists from the SOFIA program, a collaboration between NASA and the German Aerospace Center, recently examined the nebula's gas clouds in a new way. SOFIA uses a modified Boeing 747SP airliner to carry a telescope that makes observations of the cosmos. A recent upgrade to one of the instruments aboard the plane allowed the researchers to record millions of light patterns, called emission spectra, that mark spots in the Orion Nebula where a positively charged form of carbon gas is being heated and cooled. Such heating and cooling usually happens in the presence of young stars, so the data gives hints about where new stars are forming, how they form, and how many there are. When the researchers assigned colors to represent the brightness of the emission spectra and gave the image depth by representing the velocity of the glowing gas, they created a unique 3D view of the nebula and its star-forming engine. It was while exploring the data in this way that the scientists discovered a structure they nicknamed "Orion's dragon." They presented the new data at a meeting of the American Astronomical Society in Seattle in January. The dragon's blue body represents an area where the spectra are brightest. Its large belly is formed by high velocity gas being expelled outward from a star at the center. A screenshot from the Orion 3D video shows Orion's dragon on the left and an artist's conception of the dragon on the right. The "dragon" is one of two bubbles of rapidly expanding gas the researchers found surrounding young stars in Orion's Nebula. "The expanding molecular gas in the bubbles will no longer be available for star formation for several tens of millions of years," said Hal Yorke, director of the SOFIA Science Center in Moffett Field, California, in an email to Inside Science. "The data set thus points to the smoking gun of how star formation is being regulated (i.e. "turned off") in galaxies," he wrote. 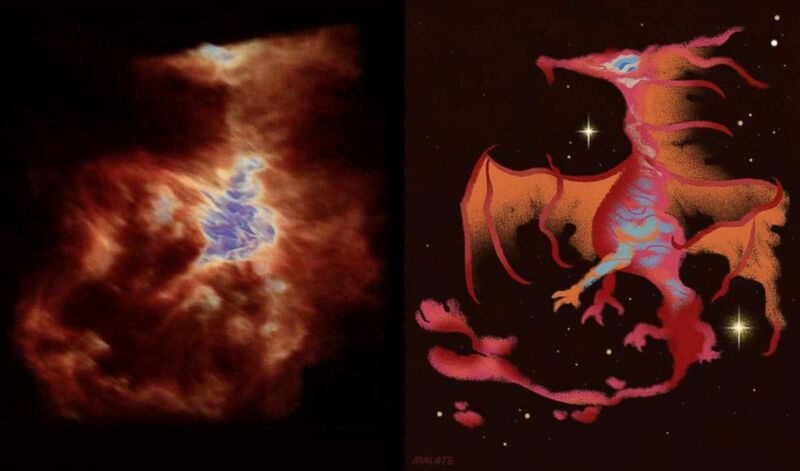 This isn't the first time a dragon has been spotted in Orion's gas clouds. In 2011, commenters on the internet site Reddit spotted a celestial battle between a man and a fitter looking dragon in a Hubble space telescope picture of the Orion Nebula. Still, Yorke expressed his personal preference for the new, pudgy dragon. "Actually, this is my favorite," he wrote. Inside Science is an editorially-independent nonprofit print, electronic and video journalism news service owned and operated by the American Institute of Physics.